It’s no wonder then that sites like Pinterest and Instagram have so rapidly become such dominant sites on the social media landscape. And why billions of dollars are invested in visual advertising on TV and billboards. 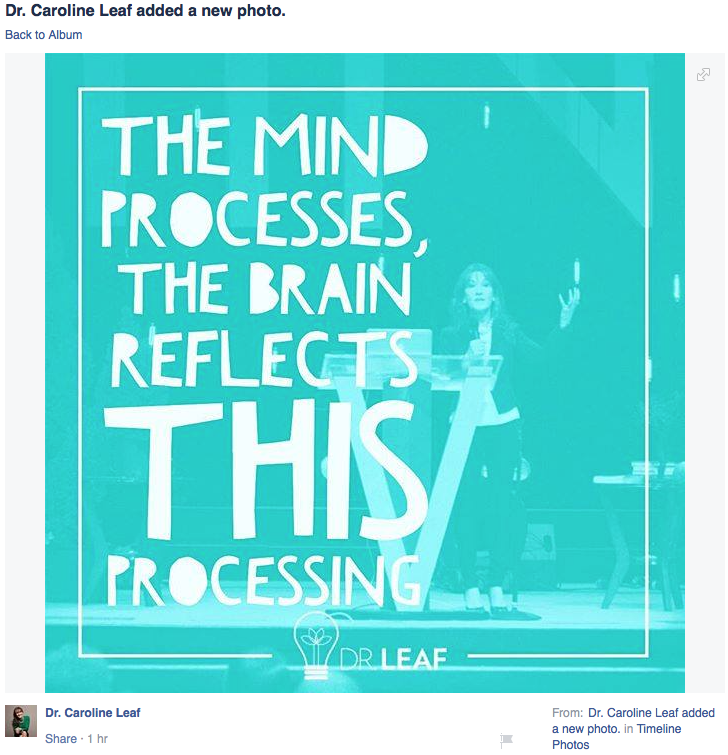 Dr Caroline Leaf is a communication pathologist and self titled cognitive neuroscientist. In the last few weeks, she’s gone for a new look for her Instagram and Facebook posts – gone are the simple lines, plain text and stand alone logo. Her posts have gone glam, with backgrounds of her photo treated with coloured layering and shading, overlaid with Dr Leafs favourite text. Sometimes the text is pretty easy to read. Other times it looks like a 4th grade class got to take turns picking the font and text size for each different word. But hey, it’s edgy, it’s happening, it’s so hot right now. I’ve written about this meme a few times (here, here, here and here, as a small sample). But let’s relook at it again, since Dr Leaf is unwilling to reconsider the statements lack of validity. Does the mind really control the brain, or does the brain control the mind? Well, if the mind was separate from the brain and controlled the brain, then the mind would be able to function independently of the brain. And also, if the mind was separate to the brain, then changes to the brain would not influence the function of the mind. It’s difficult to show that a person has a mind without a brain. You can’t really remove someone’s brain and then put it back again, so not many people are keen to volunteer for that study. But anecdotally, have you ever heard of a person who has woken from a coma having spend all that time in deep thought? What IS much easier to study, and has been proven over the course of centuries, is the change to our cognitive function when our brain is changed, physically or functionally. The mind changes when the function of the brain is changed by medications. The mind changes when the function of the brain is changed by illicit drugs. The mind changes when the function of the brain is changed by electrical stimulation. The mind changes then the structure of the brain is changed by tumours or injuries. In 1848, a man named Phineas Gage was packing gunpowder in some rock when an accidental detonation blasted a foot-long iron rod through the left face and forehead, severely damaging the left frontal lobe of his brain. History records that his personality changed from polite, well mannered, and well spoken to fitful, irreverent, impatient of restraint or advice, obstinate and capricious . Some might argue that the mechanism of injury might be the variable that could change someone’s personality. After all, if an iron rod was blasted through my skull, I might be a little antsy too. But other structural change to the brain, not associated with a sudden traumatic event, can also result in personality changes – it’s well recognised that personality changes can be the first presenting symptom of brain tumours, for example. Though the brain doesn’t have to be horribly distorted for the mind to change. In the last couple of decades, a tool has been developed called TMS – short for transcranial magnetic stimulation. A magnetic pulse is delivered over a part of the skull, passing through the bone to reach the brain, causing changes to the electrical current running through the nerve cells. Stimulation of different intensities can either turn off the nerve cells or excite them. TMS has become a great tool for studying cognitive neuroscience because it directly changes the function of the brain in a well localised and temporary manner. It’s also easy for scientists to blind the subjects to whether they’re receiving the treatment or a sham treatment, so the results are reliable. Research shows that when the frontal lobes of the brain are changed by the electrical signals, their executive function also changes . Changes to the function of the brain are known to change the function of the mind and have been known to do so for centuries. From religious hallucinogens to Woodstock hippies, drugs of various forms have been used to alter mood, thought, and perceptions of reality. But there’s a drug that’s much more common, that’s known for its ability to alter our brains thinking ability the world over, and even Dr Leaf enjoys it. Like most people, my morning doesn’t really start until after my first cup of coffee. Sure, I’m functional, but barely. Fifteen minutes after the first short black is in my system, I find that I’m much more alert and my thinking is clearer. What’s changed? Is it my mind changing the function of my brain, or is it the coffee, specifically the caffeine in it, that’s changing my brain which is in turn is making my mind clearer and sharper? I think the answer is obvious. Caffeine is the most commonly used recreational drug in the history of mankind, and every cup of java (real coffee that is, not the travesty that is decaf) is more proof against Dr Leaf’s dogmatic misrepresentation of basic science. So, if the mind is changed by alterations to the structure and/or function of our physical brain, it follows that our mind must be a function of our brain. Therefore, the mind does not process, while the brain simply hangs on for the ride. Rather, the brain processes, and our mind reflects this processing. Dr Leaf can tart up her memes all she likes, but until she changes the content of her memes to match some actual science, it’s all just smoke and mirrors. The truth doesn’t need visual pimping. It is simply the truth. Fumagalli M, Priori A. Functional and clinical neuroanatomy of morality. Brain : a journal of neurology 2012 Jul;135(Pt 7):2006-21. Baars BJ. Global workspace theory of consciousness: toward a cognitive neuroscience of human experience. Progress in brain research 2005;150:45-53. Guse B, Falkai P, Wobrock T. Cognitive effects of high-frequency repetitive transcranial magnetic stimulation: a systematic review. J Neural Transm 2010 Jan;117(1):105-22. This entry was posted in Biological, Caroline Leaf, Psychological and tagged acquired brain injury, brain, caffeine, dr caroline leaf, Dr Leaf, Facebook, function of the brain, hallucinogen, Insstagram, meme, mind, mind changes, phineas gage, processing by cedwardpitt. Bookmark the permalink.